Home Odds and ends Starting Over… Again. Even for people used to living in cultures other than their own, where sometimes practically nothing seems to make sense, shifting to a new environment can be a challenge. The prospect of not understanding the language, customs or social cues (making it seemingly impossible to complete the simplest of tasks) is enough for most people to think, ‘Na… stuff that,’ and stay at home where logic is relatively abundant and everyone knows more or less what the hell is going on. This is probably a very good thing because if everybody at once decided to up and leave their homeland (to then spend almost all available time and energy trying to figure out how to eat, catch a bus somewhere or get the internet connected), the global economy and human civilisation as we know it would probably collapse in about three weeks. For whatever reason, my family and I have chosen the lives of perennially slightly confused professional drifters dwelling in the periphery of common sense… and so have most of our friends. It’s kind of comforting to know this about ourselves, even if generally we prefer not to enquire on a conscious level as to why we feel more comfortable being uncomfortable. This small amount of self-awareness (too much more might be dangerous) has helped me to find some sense of logic behind our recent decision, after seven years in South Korea, where we could finally make some sense of our surroundings, to leave… and start from scratch once more in the middle-east. I assumed it would be easy. The logic was sound. After all, as a westerner and an eastern European my wife and I have learned to negotiate and reconcile our own cultural differences, and together we learned how to survive and thrive in the alternate universe known as Korea. This next move would simply be a matter of re-adapting to a whole new style of crazy (in the most positive sense). Of course, our daughter had no say in any of this, but with that most remarkable of abilities possessed only by little kids, she thinks all the wonderfully ridiculous things that happen to and around my little family as we wander around the planet… are completely normal. She’s never known different. Anyway, starting our new life in the Sultanate of Oman has been reasonably easy (with the aforementioned understanding and acceptance that it would be difficult). The sun shines (relentlessly), the landscape is ruggedly beautiful, people are amazingly friendly and life is good. Here’s a couple of first impressions from our new peninsula of choice. It’s illegal to drive a dirty car here. I’m not sure if that’s because if people didn’t wash their cars, they (the cars I mean) would soon look like the light brown military vehicles camouflaged to blend into the desert scenery (meaning the next dust storm would settle to reveal a 300-car pileup on the Muscat Expressway). I can only guess. Anyway, the fine for having a dirty car is apparently much greater than the fine for speeding, which the locals probably appreciate because for some reason the only time Omanis prefer to get things done quickly is when behind the wheel. I won’t rant on too much about driving stereotypes, except to say I’ve noticed that it is customary here to hit your hazard lights as soon as the motorist ahead of you applies their brakes for any reason. 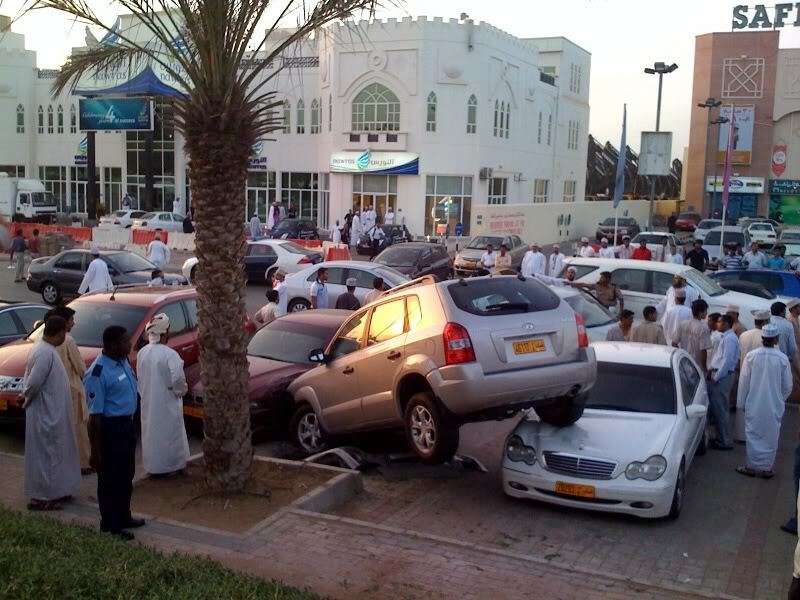 Aggressive tailgating and absurdly inappropriate driving seems to be fine here, but remember, any kind of verbal abuse, physical gesturing (or even visibly showing frustration) is illegal in Oman, so just respond to whatever lunacy you may encounter with a friendly smile. If personal safety is a concern, get a big car. Never, under any circumstances, give someone ‘the bird’. When I was a kid in Australia, we loved the occasional snowy winter morning and that magical radio announcement declaring the school cancellations. Oman hasn’t witnessed snow since the last ice age. 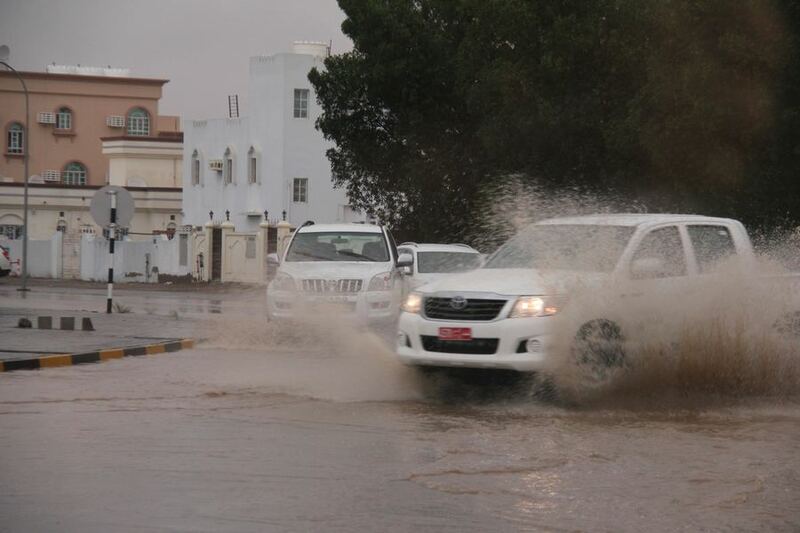 It actually receives almost no precipitation of any kind, and the Omani people just aren’t terribly equipped for it. School is cancelled at the first hint of rain. My second day in Muscat. Haven’t seen a drop since. Oman’s live music scene has recently been regulated by the Ministry of Tourism (I’m not sure yet whether this Ministry supports or opposes tourism), which banned live bands from dancing when performing in hotel nightclubs of less than 4-stars. Also, the bands are now to be limited to three members, and they must henceforth be referred to as ‘a talented group of artistes‘. This weekend Sir Tom Jones was in town, and I can only assume that his own accompanying group of talented artistes numbered more than three. His gig was at Shangri-la’s (5-star) Barr Al Jissa Resort and Spa (people of means enough to attend such venues can clearly be trusted to encounter dancing). Perhaps the regulatory authorities assumed that Mr Jones himself, at age 73, would not be moving about too much on stage. 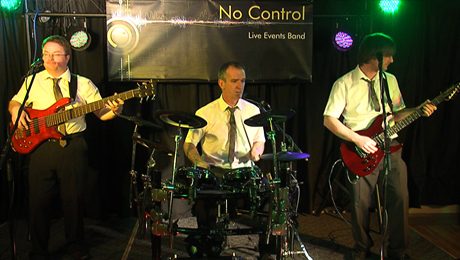 The ironically named ‘No Control’ band. These guys demonstrate appropriate levels of control for 3-star Muscat music venues. To be continued… as we gradually learn about peninsularity, Arabian style. 7 Comments on "Starting Over… Again." Great reading again stu. I just saw a car wash in suwon called “car love shop” your article reminded me of it. Keep up the good work. So, can you only move to peninsulae to keep the blog name and domain? Yep, looks that way Rufus. Hmm, that is kind of limiting isn’t it. Damn. Hahaha this seems wonderful and strange. Can’t wait to read more about it, I’m guessing there is enough absurdity to last a few more blog posts.? Cheers Sally, I reckon there’s a good few years worth of material around these parts. Nice blog you have by the way!